LIYSF - Rubber Ducks, Pokémon Go, and the 'MonicaGrady' Asteroid? What does the origin of life, Pokémon Go, and the ‘MonicaGrady’ Asteroid all have in common? There aren’t many people with an asteroid named after them. Monica Grady has Asteroid 4731, aka ‘monicagrady’, named after her. Monica is a Professor of Planetary and Space Sciences at the Open University. 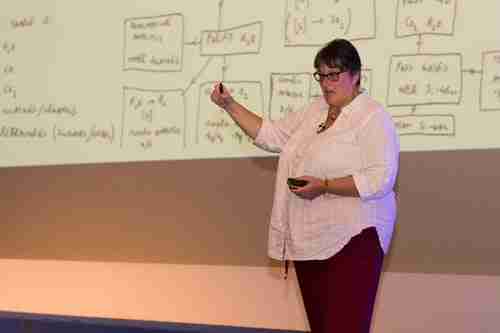 Monica spoke at the London International Science Forum this year, and we talked to her to find out what she studies. A Day in the Life of Monica Grady – what does that look like? Monica, what brings you to LIYSF? “What’s really impressed me about LIYSF is the fact that you have such an enormouse number of students from all around the world who are meeting with one another, talking to each other and interacting on projects in teams. They’re making friendships which will last way beyond this forum. Why do we need more females in science and engineering? Monica studies asteroids and comets by analyzing small pieces from meteorites in her laboratory, in order to understand processes that led to the evolution of life on earth. The 67P/Churyumov–Gerasimenko is a comet that Monica has been involved in with on the Rosetta mission and the European Space Agency, aimed at getting Rosetta’s lander (Philae) onto the surface of the comet. When it landed in November 2014, it was the first spacecraft to land on a comet and Monica’s team were able to take samples of the comet. Early results found that the surface of the comet was incredibly dense, although beyond the outer layer, Monica described the interior resembling a ‘fluffy ball’! By looking at the ratio of deuterium to hydrogen in the water from the comet, the team were able to rule out the hypothesis that water found on earth comes from comets. 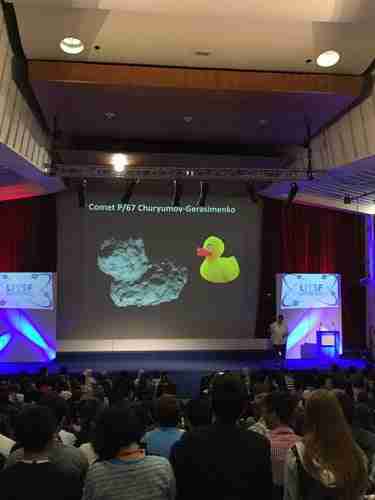 Monica also compared 67P to a rubber duck! The LIYSF participants were left astounded (but not speechless!) as Monica concluded her session on the Rosetta mission.